For the past few years high street retailers have flocked to the online world, trying to play catch up with online rivals who have been gaining market share year after year. However there has been a gradual change in retail evolution; online retailers are now moving to the high street. This evolution is called ‘clicks to bricks’ and is changing both the high street and retail industry. Online retailing is thriving. People in their 20s and 30s do about a quarter of their shopping online. In 2012, American online sales increased by 16% to $225 billion. However, it seems unlikely that online retailing will ever completely replace bricks-and-mortar stores. The Economist reports that Britons are one of the keenest online shoppers, but still 65% of Britons prefer buying in-store. This is because online retailers lack one major offering; a tactile experience. Online retailers also have a lot of variable costs such as buying ads on Google, delivery costs and the fact that shoppers return a quarter or more of clothing they buy online. This tends to eat up their advantage over traditional retailers. 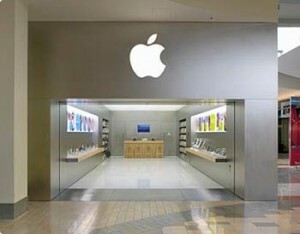 A physical store allows customers to really experience Apple products. The idea is to give consumers the tactile experience they can’t get online. Customers can touch, taste and try on products that they like. It is much easier to appreciate an iPad’s crispness and responsiveness in a physical environment which is why Apple created brick and mortar stores that are beautifully designed, with helpful staff. Parents also like to get a feel for prams and buggies before they purchase. Online retailer, Kiddicare, have developed a brick and mortar store in which they developed the Walk in the Park indoor track for parents, allowing them to get a feel for the latest buggies. The majority of these physical stores are seamlessly connected to their online store, allowing customers to see products they like in-store and buy the product online. Clicks to bricks use digital firepower to enhance the experience offered to customers. It allows online retailers to create interactive showrooms; improving service delivery, delivering personalised experience, enhancing brand experiences and creating customer loyalty. The digital firepower being used includes touchscreens, interactive kiosks, digital signage and tablets. The stores offer an experience that the shopper feels is worth the trip to the high street. The premium online fashion retailer Piperlime has opened a brick and mortar store which is merchandised like their online store. Interactive kiosks allow customers to buy a product if it is not available or not in their size. Piperlime believe that a permanent brick and mortar presence strengthens the relationship with customers, creating loyalty and generating extra sales. Consumers no longer see a distinction between online and offline shopping. Whether it’s searching on a laptop, browsing main street shops or hanging out at the mall — it’s all shopping. It is clear that the future of the high street is set to have more and more online retailers developing brick-and-mortar stores that offer a real-world experience of their online world. The retailer has to integrate both the physical world and the online world to create a seamless brand experience for the consumer. The experience offered to customers is vital to the success of clicks to bricks which is created through in-store digital media. The online retail industry is evolving and online retailers that are too slow to reinvent themselves will be left behind.